Titan's ice shell, which overlies a very salty ocean, varies in thickness around the moon, suggesting the crust is in the process of becoming rigid, researchers say. The subsurface ocean inside Saturn’s largest moon, Titan, could be as salty as any body of water here on Earth, a new study reports. Gravity data collected by NASA’s Cassini spacecraft suggest that Titan’s ocean must have an extremely high density. Salt water has a higher density than fresh water because the presence of salt adds more mass to a given amount of water. "This is an extremely salty ocean by Earth standards," study lead author Giuseppe Mitri, from the University of Nantes in France, said in a statement. "Knowing this may change the way we view this ocean as a possible abode for present-day life, but conditions might have been very different there in the past." The average salt concentration in Earth’s oceans is around 3.5 percent, but parts of the Dead Sea can reach 40 percent salinity. 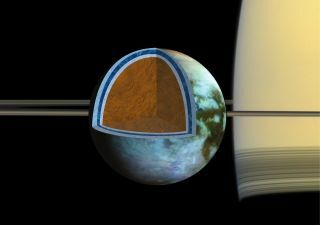 Titan is surrounded by an ice shell, but below the surface, scientists believe there is an ocean of liquid water that could be just as salty as the Dead Sea. Cassini collected gravity and topography data during its flybys of Titan over the past 10 years, allowing researchers to create a new model of the structure of the moon’s outer icy shell. The new model suggests that the thickness of the icy crust varies across the moon’s surface. This means that the ocean underneath is probably in the process of freezing, too. If the ocean is freezing, it would decrease the chances that the ocean could support life, since freezing would limit the exchange of materials between the water and the surface, researchers said. The new data could also provide some insight into Titan’s unique atmosphere, which is consistently around 5 percent methane. It is still a mystery how Titan maintains methane in its atmosphere since sunlight quickly breaks up the gas. Scientists believe some kind of natural process must be cycling the methane into the atmosphere; from there, it falls back down to the surface as methane rain, similar to the water cycle on Earth. Since Titan’s surface is mostly frozen, researchers think any methane rising into the atmosphere must be coming from a few scattered unfrozen "hot spots." The $3.2 billion Cassini mission launched in 1997 and arrived in orbit around Saturn in 2004. The mission also dropped a probe named Huygens onto the surface of Titan in January 2005. The new study was published July 1 in the journal Icarus. Follow Kelly Dickerson onTwitter.Follow us @SPACEdotcom, Facebook or Google+. Originally published on Space.com.